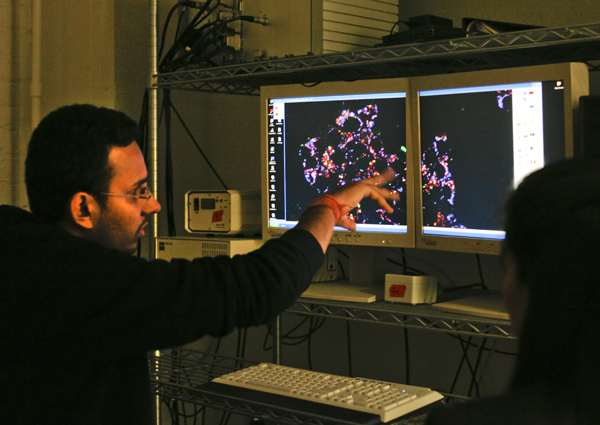 Saubrabh Trikha observes pancreatic beta cells for his microbiology research with assistant professor of biology molecular neuroendocrinology Aleksander Jeremic. Despite pinched government budgets that drained the federal grant pool, GW professors spent 7.3 percent more on research projects last year. The increase, which brought GW to $162.9 million in research spending last year, helps the University rebound after two years of declines and as other universities saw research spending dip in the midst of sequestration. The amount of research expenditures is a top indicator of research success because federal agencies typically bankroll only the best proposals. “When there’s a hiccup in federal funding, like the sequester, as there is now, that’s something to be concerned about, but so far we’ve been bucking that trend,” Leo Chalupa, Vice President for Research, said at the Board of Trustees meeting Friday. The amount GW researchers spent jumped more than $10 million in a year, but did not surpass the $164.5 million they spent on research in fiscal year 2010, Chalupa’s first full year at the University. GW received $115 million in federal funding last year, about $1 million less than they received from federal sources the year before. That came despite the National Institutes of Health giving out about 650 fewer grants this year, while the National Science Foundation gave out about 1,000 fewer. To make up for the squeeze, yhe University invested about $4 million of its own funds in research last year – nearly double what it spent two years ago. Other funding came from foundations, corporations and state funds. GW has tried to strengthen its partnerships with private foundations and corporations in the past year, turning to local technology giants to secure funding. Faculty also received $21.8 million in grants from private foundations last year. The University has used new buildings for the School of Public Health and Health Sciences and the School of Engineering and Applied Science to lure top researchers to GW. The School of Public Health’s federal funding remained steady this year, Dean Lynn Goldman said. While the grant application has always been competitive, sequestration has caused researchers, including Neil Roach, a post-doctoral fellow in the anthropology department, to rethink their strategy for proposals. He said more faculty are teaming up for interdisciplinary research projects instead of conducting smaller solo investigations. The University has aggressively tried to promote research, not just policy work or teaching, during University President Steven Knapp’s tenure. The University office has increased its outreach to faculty, meeting one-on-one with newly hired professors to help them draft grant proposals. If faculty submit their applications three weeks before they are due, a grant editor from outside the University will review them. Jennifer Wisdom, associate vice president for research, has met with researchers in every school in the year she has been at GW and led summits and training sessions for researchers to improve their grant proposals. “I am a researcher myself, and I am working to streamline our processes to make it easier for faculty to focus on their science and service and teaching projects instead of on the paperwork,” she said. Provost Steven Lerman said hiring new faculty from universities that have always had a strong emphasis on research has helped grow GW’s own research culture. “They’re coming in with the skill set to build large research programs and are being very effective in getting large research awards,” Lerman said. The University offered buyouts to faculty in the Columbian College of Arts and Sciences in 2009 and SEAS in 2011 to open spots for newer faculty. GW also hired more faculty than other universities after the 2008 recession because it had strong financial footing.